After several rather stressful weeks, my husband and I took advantage of having our son home from college for a 4-day fall break and escaped to one of our favorite day-trip destinations Friday. It was a nice day, still unseasonably warm here in Arkansas, but just cloudy enough to make it comfortable to spend the day outside. 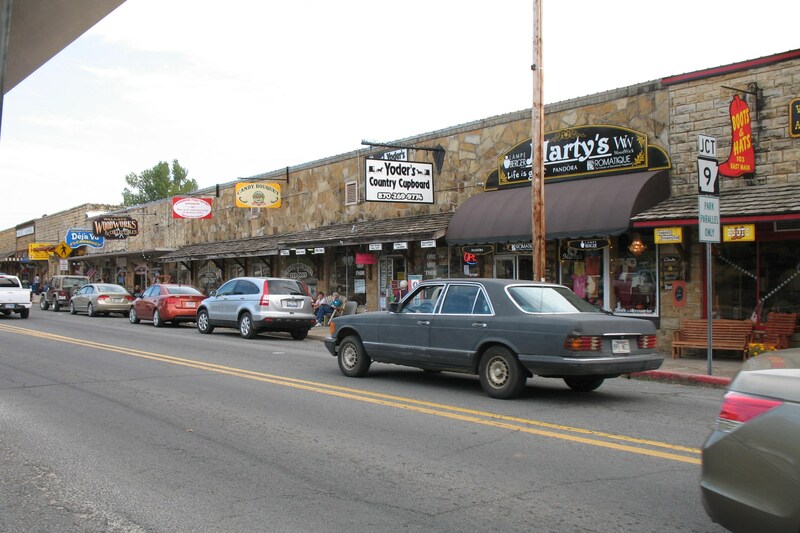 Mountain View, Arkansas is a picturesque town located in the rolling hills alongside the White River, about an hour and a half north of Little Rock. With a population of just under 3,000, the town is off the beaten path, and the drive there from my home is almost all two-lane country roads. Our dry, hot summer has kept the autumn colors from being as vivid as in some years, but it was still a pretty drive with plenty of red, orange and yellow trees to admire along the way. We passed miles of pastureland interspersed with several little towns and isolated homesteads. The occasional deserted old rock-walled house with a falling-down barn in the background piqued my imagination as I wondered when the house was built, how many generations lived there, when the last inhabitant finally moved on. The rock-walled Stone County Courthouse that sits in the center of the Mountain View town square was built in 1922 and is listed on the National Register of Historic Places. Surrounding it are more stone buildings holding shops, crafts galleries, cafes and ice cream parlors for the tourists who come for a peaceful day of shopping and music. The area was relatively isolated from the rest of the state until the 1950s, and had no electricity until the 1930s. 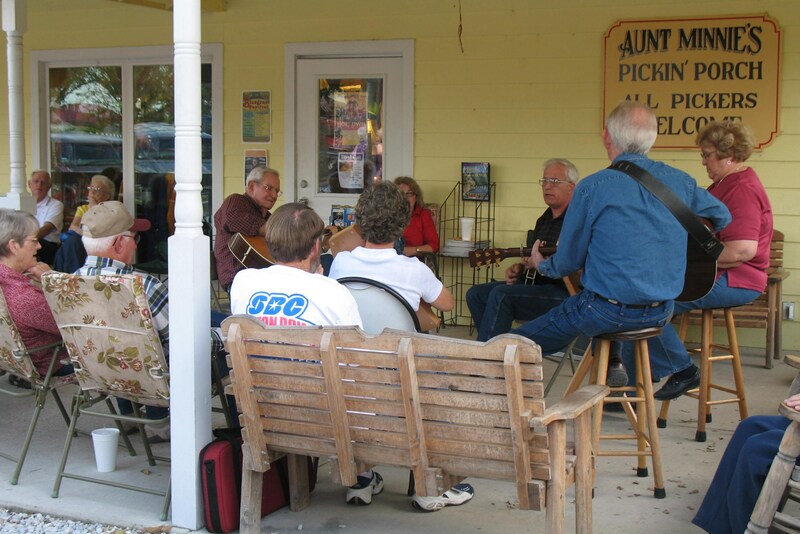 For entertainment, local residents gathered in the evenings to play and sing folk music, a tradition that continues until today. 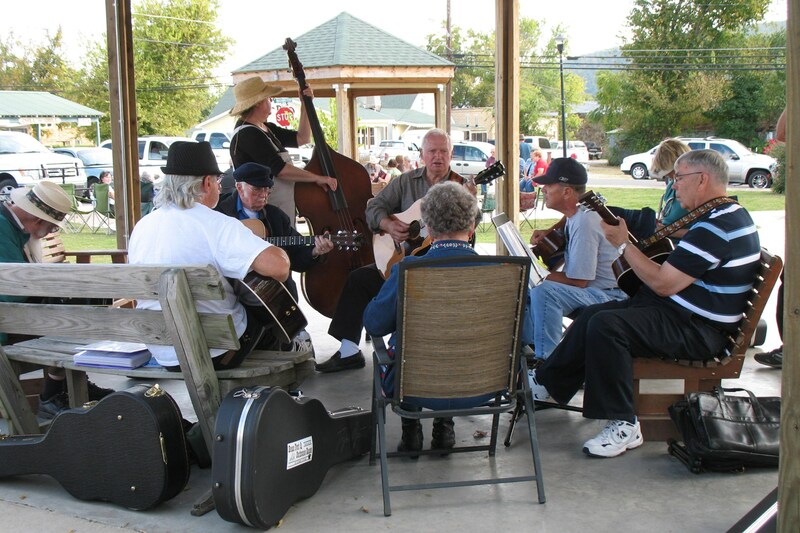 All around the courthouse square, you’ll find groups of people “pickin'” and singing. I counted eight different impromptu groups playing at one time during our stroll around the square on Friday afternoon. Anyone with an instrument is welcome to join in, everyone else is encouraged to sit and listen a spell. 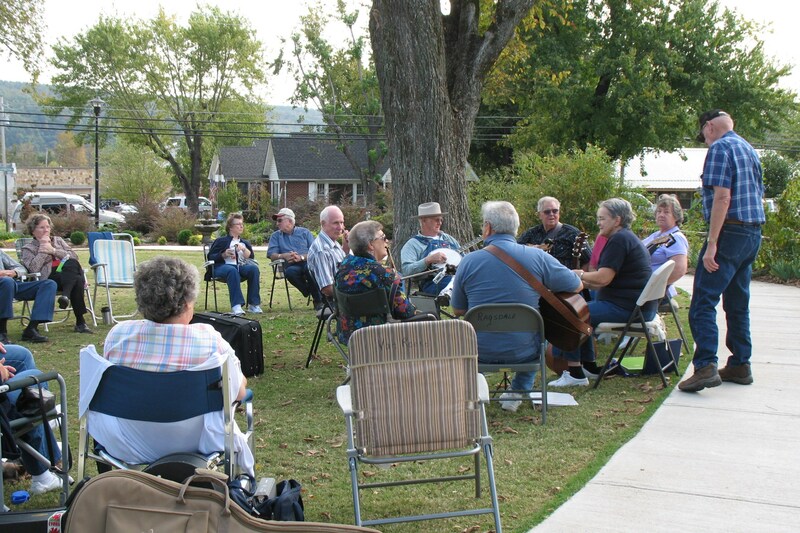 They gather on the grass, on shop porches, under pavilions in Washington Street Park, and it’s perfectly acceptable to sit and listen to one session for a while and then move to the next group to hear different singers and instruments. Listeners bring lawn chairs or blankets and sip lemonade or munch on ice cream cones and funnel cakes purchased from a couple of discreet concessions stands. In the evenings, fire pits provide a little warmth and coffee and hot chocolate are the beverages of choice. The musical selections are totally random — old folk and bluegrass songs, gospel hymns, country hits from the 40s and 50s — and even a few Elvis tunes. If you stand in one place and open your ears, you’ll hear a simultaneous medley surrounding you. Little motels and inviting bed and breakfast inns are grouped nearby, for those who want to sit on the square late or who attend one of the music and comedy shows in local theaters. Other area attractions are the spectacular Blanchard Springs Caverns, which my family has toured many times, and the Ozark Folk Center Crafts Village, where pioneer crafts are demonstrated and available for purchase. Not to mention the outdoor activities in the area — hiking, camping, fishing, canoeing and kayaking. Annual festivals — one including very popular “outhouse races” — draw tourists year-round. Is there any wonder why Mountain View is one of my favorite places to visit whenever I can slip away for a few hours, and why I’ve set a few scenes from books there? My husband is in the process of making a mountain dulcimer — something he has always wanted to do — so we visited two local musical instruments shops to chat with the luthiers there. And as a wood turner, he enjoys admiring other turners’ work displayed in local crafts shops. We enjoyed visiting with a dulcimer player performing in one of the shops who impressed us with his knowledge of folk music history — especially Celtic folk music, one of my favorites. We spent a couple of hours wandering through antique stores, finding a few little treasures buried among the old collections (my mother used to say you know you’re getting older when you find mementos of your childhood in the antiques stores). Our 21-year-old son might not have appreciated some of the music and shopping as much as we did, but he indulged our nostalgia (and savored the food). I returned home from that trip pleasantly tired, wishing I could have spent more hours listening on the courthouse square and eager to return. The stresses of everyday life were still waiting for me at home, but for those few hours, I could pretend to live in an earlier time, when people escaped their much harder existences with an evening of pickin’ and singin’. Maybe I’ll even learn to play that dulcimer when my husband finally finishes it. Don’t forget to enter the drawing to be held on December 1 for a holiday book package! Details can be found on the Enter to Win! tab above.